An attractive solution for your business or any venue where lots of thirsty people gather. The O2-500 was voted the best looking cooler at the Los Vegas Water Show! The O2-500 dispenses both hot and cold water, is equipped with an LG compressor, surgical stainless steel hot and cold tank, as well as a built in leak detector. Standard equipment includes our industry leading Ultra filtration four stage filter to ensure the highest quality water for you and your colleagues. The O2-500 was voted the best looking cooler at the Las Vegas Water Show! 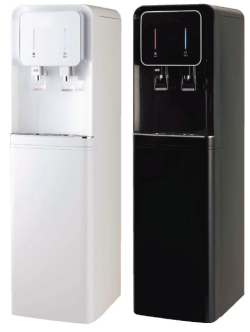 The O2-500 dispenses both hot and cold water, is equipped with an LG compressor, surgical stainless steel hot and cold tank, as well as a built in leak detector.